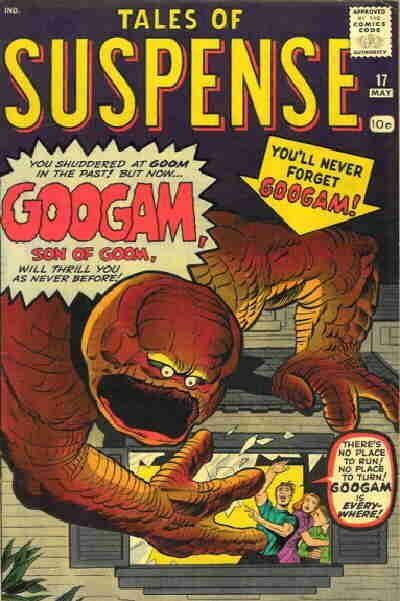 Googam is a monster that appeared in early Marvel comics in the early 1960s. Googam is actually a baby monster who was left behind on Earth by his father Goom. This post is part of the Toylab Marvel Monster series that focuses on old Marvel Monsters in preparation for the 2017 Marvel Comic event Monsters Unleashed. The Father of Googam was an alien monster named Goom. Goom invaded Earth and fled the planet leaving behind his son Googam. Goom had hidden Googam in a cave. Lacking experience and maturity the 8 ft monster woke up knowing very little. He attempts to befriend a little boy and follows him to his house. The boy sees that Googam presents a monstrous threat to his home and family and quickly comes up with a plan. He challenges Googam to game of tag. During the game boy tricks Googam into going into quicksand. Googam seemingly dies in the quicksand. Googam is revealed to be alive and is brought by the Fantastic Four into the monster isles. At one point in time Googam battles the Hulk using his powers to shrink the Hulk. He is part of a group of monsters who goes through a Monster rehabilitation program led by Mister Fantastic and Fin Fang Foom. He works for a time as a parking attendant at the Baxter Building. Googam and his fellow monster rehabilitation team, the Fin Fang Four help defeat the microscopic monster Tim Boo Baa. After the attack of Tim Boo Baa, Googam changes professions and becomes a script writer. He is also mentioned as a candidate for the Government's Initiative as a potential fighting recruit during Civil War. It is not clear if Googam will appear as part of the Marvel 2017 event Monsters Unleashed. Super Strong - Not sure how strong relative to other monsters or heroes but was shown to have strength far surpassing a normal human. Ability to affect the size of people. This is similar to Hank Pym's Pym particles.